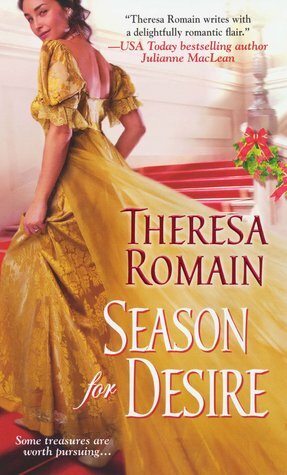 Theresa Romain writes despondent romances. Her characters are noble and good; her prose is elegant. Her hero and heroine are in a bad place when we meet them. Miss Bates likes that Romain doesn’t lay the angst on thick, however. Her characters’ sadness is perniciously persistent, like a low-grade fever. Things are wrong somewhere, but the appearance of things seems all right. Every time Miss Bates reads one of Romain’s romances, she frequently doubts she’ll finish it. And yet, each time, she does and is quite satisfied and rewarded by Romain’s HEA. Romain’s latest, Fortune Favors the Wicked is typical of the author. In 1817, retired, blind Royal Navy Lieutenant Benedict Frost arrives in London, from on board “The Argent,” to sell his sailing memoir to publisher George Pitman. His minimal pension means he can’t offer Georgette, his sister, anything but a pittance. He hopes his soon-to-be-best-selling memoir will save the day when Georgette leaves their cousins’ home upon reaching her majority. He also learns that 50 000 pounds-worth of the king’s gold was stolen. When his manuscript is rejected, Benedict realizes the reward money may serve to help Georgette. He sets off for Derbyshire to recover the gold and win the reward money. Meanwhile in Strawfield, Derbyshire, we meet heroine Miss Charlotte Perry, vicar’s daughter. She too aims to ensure a young relation’s welfare: her ten-year-old niece, Maggie, named after Charlotte’s deceased sister, Margaret. Charlotte is also in search of the gold. Benedict and Charlotte’s meet-cute is inevitable. 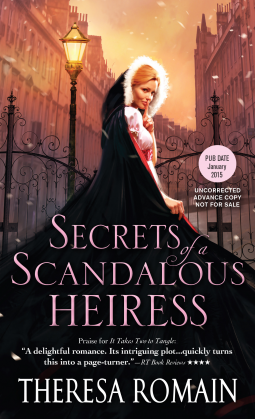 In Secrets Of A Scandalous Heiress,” the final volume in her Regency-set Matchmakers trilogy, Theresa Romain offers a romance as much about identity as finding and keeping love. Miss Bates read and loved the second in the trilogy, To Charm A Naughty Countess. The former follows the latter in theme and concern, though reading Scandalous Heiress as a stand-alone doesn’t require any previous knowledge. Romain loves to create characters who are on the fringe of a rigid and judgemental ton: they may have a whiff of scandal, or peculiarity about them. Their romance narratives see the working-out of how they accept, relish, and come to enjoy happiness despite their marginalized positions. Romain’s romances are not cross-class, but are concerned with class no less. Like her four sisters, Lady Audrina Bradleigh is expected to marry a duke, lead fashion, and behave with propriety. Consequently, Audrina pursues mischief with gusto, attending scandalous parties, and indulging in illicit affairs. But when an erstwhile lover threatens to ruin her reputation, Audrina has no choice but to find a respectable husband at once. Who would guess that her search would lead her to Giles Rutherford, a blunt-spoken American on a treasure hunt of his own? When a Christmas snowstorm strands the pair at a country inn, more secrets are traded than gifts – along with kisses that require no mistletoe – and Audrina discovers even proper gentlemen have their wicked side.